What looks at first like another of St. Louis attorney Rachel Gold’s variously wacky criminal cases spreads its wings into crossover territory. Nobody would have predicted fireworks when Rachel agreed to represent her mother’s friend Ruth Alpert, a secretary laid off by Beckman Engineering after a lifetime of service. But when Beckman’s legal team, headed by piranha Kimberly Howard, weighs in with countercharges about Ruth pilfering paper clips—well, as Ruth says, “A girl hears things” that can up the ante on her side as well. The things Ruth has heard, that Beckman and five other nearby construction firms, have been engaging in a bid-rigging conspiracy for 40 years, lead to a qui tam suit that casts Ruth as chief whistleblower and puts her original private suit in the shade. By the time of Kahn’s opening episode—a meeting between Rachel and a rare witness willing to testify against the alleged conspirators ends with the witness getting shotgunned to death—it might seem clear that the case is bound for summer movie turf. Not so: Kahn (Sheer Gall, 1996) is after bigger game than Beckman and its possibly murderous cohorts. 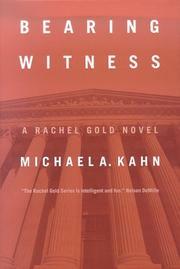 As Rachel and her buddies, romantically minded special prosecutor Jonathan Wolf and romance-proof man-mountain Prof. Benny Goldberg, scrabble for evidence of price-fixing and wonder what on earth could have kept the flinthearted Conrad Beckman in bed with his fellow conspirators for nearly half a century, they gradually link the festering malfeasance to the wartime German-American Bund and the living, breathing Bishop Kurt Robb, spiritual leader of the Church of the Aryan Jesus. Some readers will find this last layer of revelations riveting; others will shake their heads in bemusement over Rachel’s conspiracy fixations. Everybody will agree, however, that Rachel’s sixth case is a lot less antically amusing than her first five. Counsel is deadly serious this time, and no wonder.